This is the construction progression of an all wood 40′ DIY tiny house boat sent in by Patricia Hong. It features plywood flooring and treated pine deck beams. Below you can see the 40 ft. long floats, the walls going up, the metal roof being installed, and more. When you go inside, you’ll find a kitchen area, living area, lots of built-in storage, and more. Have you ever thought of building your tiny home on floats? Please enjoy, learn more, and re-share below. Thank you! Our big thanks to Patricia for sharing! You can share this DIY floating tiny home with your friends and family for free using the e-mail and social media re-share buttons below. Thanks. If you enjoyed this tiny house boat you’ll absolutely LOVE our Free Daily Tiny House Newsletter with even more! Thank you! living in a boating state, I love boats. Boat building with plywood has been one of the first system for DIY because its affordable , requires minimal tools and skills. This one is a good example what c an be done when it comes to houseboats. I love the details, great job from riverboat. A houseboat is easier to dock then parking a tiny house on wheels especially here in FL. Although this one is designed for inland waterways I am sure you can build this way a houseboat suitable for the high hurricane risk of our FL waters. A great option if someone loves the water and want to spend his retirement or weekends/holidays close to nature. Wondering how much would be the cost. For anyone contemplating doing something like this , be warned , it is a big job , will most likely take twice as long as you had planned , and it will cost a lot more than the original projected budget. Go as small as you can ! Maybe you will still get your riverboat / floating home Zachary. Some really nice houseboats here , to be sure. A 40 foot boat, of any type, is ‘not’ tiny. The hulls are 40 ft long to carry the weight. The cabin is 25 ft long x 12 ft wide. The cabin is 25 ft long and 12 foot wide. The pontoons are 40 ft long in order to carry the weight. My tiny house needs ‘l’il old colonial’! 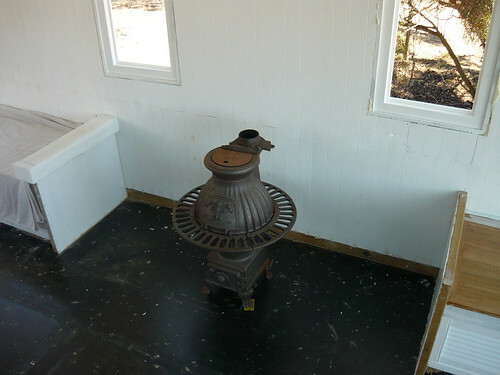 Where did you find that adorable little woodstove? I’m working on fixing up a camper that is set up for a woodstove but needs a smaller sized one such as that one. Where to get them at? I don`t know where you are located Lisa , all I can tell you is that this is an old Australian made woodstove .They used to be common here , but are now getting harder to find. The problem with most of the ones that are to be found now is that the skirt ( the casting around the middle ) usually has broken sections . These were Australian made wood stoves. They were common some time ago , but are now harder to find. Most of them have a broken skirt ( the casting around the middle ). 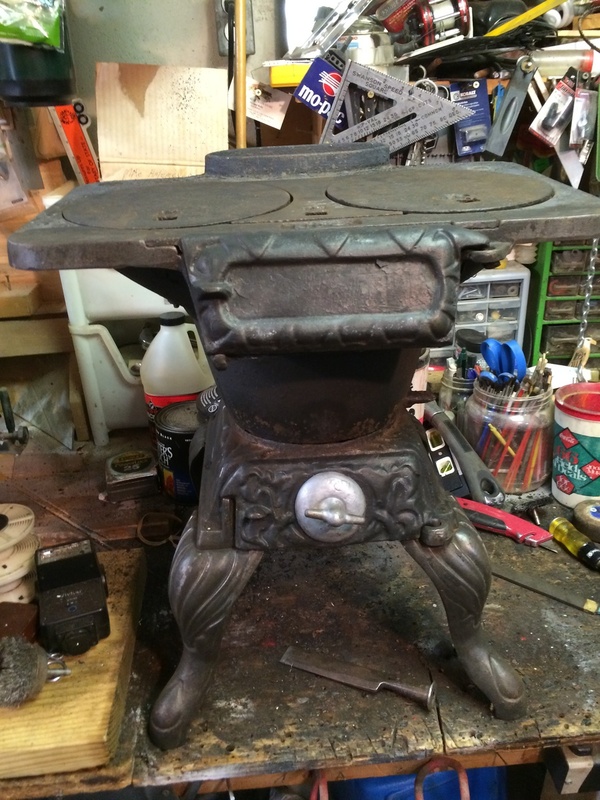 Its an Australian made wood stove Lisa , it was commom once , not so much now. Pretty; liked the materials used. White on exterior is glossy and shiny, should be lovely on the water! THAT is so cool!! Love it!